Develop The High Performance Edge! "Powerful, Practical, and Great Advice on High Performance! Cindra Kamphoff's Expertise Will Inspire You To Be At Your Best." In football, as in anywhere else in life, your goals change as you move along. Outside circumstances can and all too often do adjust your plan. Rather than focusing on all the things I can’t control—variables that will change whether or not I want them to—I have to keep my mind on the opportunities I can control. That’s how I made it where I am now. Your mind can do crazy things—when you’re an athlete, you realize how important that is. And that only gets harder when you get to the higher levels of the game. But if you keep control over your thoughts, taking things one play at a time, amazing things can happen. At the end of the day, I play because I have a blast doing it—that’s part of my why. I tell my wife all the time: I wake up at 5 AM ready to go to work because I’ve got the best job in the world. 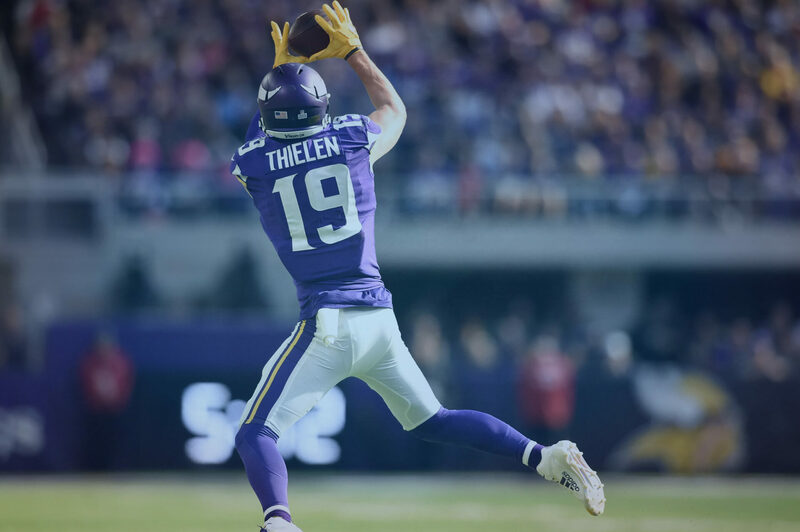 The beauty of football is you’re never going to be perfect. You’re always striving for that perfection, but you won’t make it every time. If you don’t have that love for the game, if you can’t embrace failure as valuable because it makes you a better player, you’re not ever going to be the best you can be. It won’t always feel good. People don’t understand; they watch what you do on Sundays and think that’s all there is to it. But there’s so much more that goes into your performance on game days. There will be a lot of nights where you’ve had a rough practice that leaves you feeling crushed. Or there will be times you’re just in a lot of pain; Man, my body doesn’t feel that great. But grit is such an important thing. You have to fight through the hurt, you have to persevere. Your best self is the one at the other end of that trail of grit. It would be a shame if you never knew that person. Know yourself. Know what gets you to your best, highest level. What keeps you motivated even when the struggle and discomfort make you wish you could curl into a ball. There will be a lot of trial and error, and you’ll have to stay committed—that’s why I still see Cindra each week. If you don’t keep your why in mind, you’ll have to start from square one again and again. If you can keep building on your why as a foundation—if you never stop searching for what makes you the best version of yourself—you’ll take off beyond boundaries you never even knew were there. That’s what Beyond Grit is all about. Others can refer to high performance as 'greatness' or 'mastery'. I call this mindset the 'edge'. We 'perform' every single day, in each role we hold in life. Every day, I perform as a professor, leader, speaker, writer, coach, friend, athlete, wife, and mom. You likely perform in some of the same or in entirely different—and often challenging—roles, too. In every role, your mind is essential to your success. Inside the Beyond Grit Academy, you’ll discover the life-altering strategies of the world’s most successful executives, athletes, and entrepreneurs. In my research as a professor, I have found that top performers—Oprah Winfrey, Lebron James, Bill Gates—all practice the same mental habits. For these individuals and for us, the High Performance Edge is a purposeful, daily pursuit of excellence. In other words, great minds do think alike. To live a High Performance Life, we must be fully present, engaged, in control, and confident. When we live in this way, we become more consistent and succeed above and beyond the standard. We become gritty. As you live the High Performance Life, you’ll become practiced at being mentally strong, meaning you take control of your thoughts, your actions, and your destiny. You can grab hold of the goals in front of you no matter how beyond reach they may seem. Your mental strength is key. When you live a life of high performance, you tackle difficulties with gratitude, recognizing that struggle is necessary. Problems are puzzles that can be understood and solved. With a High Performance Mindset, nothing is too hard or impossible. But what about the times our own psychology or mindset get in the way? What about the times we get in our own heads, overthinking our decisions and doubting ourselves? How often do your limiting beliefs hold you back? How often have you allowed “paralysis by analysis,” irrational thinking patterns, and blame to keep you from living the life you deserve? In my work, I’ve seen how fear can take over our bodies when we don’t take command of our emotions. Working with some of the world’s best athletes and top business executives, I can tell you that even they experience anxiety and nervousness that can shake them. Just like the rest of us, they can overthink their decisions or doubt themselves. But the world’s best have 10 powerful practices that they undertake deliberately and continually and that's what you are going to learn inside the Beyond Grit Academy. You may think that mastering your mindset is like riding a bike—once you learn it, you can always do it—but actually living a High Performance Life requires ongoing attention. The world’s best know this is true. "Human performance is about actions, relationships, and the development of a long-term strategy for success. Cindra understands this, and her work offers a compelling look into what it takes to be at your best in all avenues of competition and life." 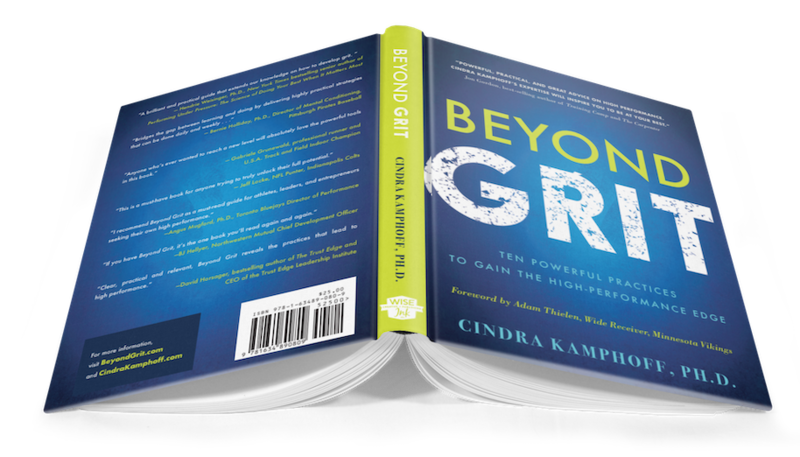 "Beyond Grit is so amazing! 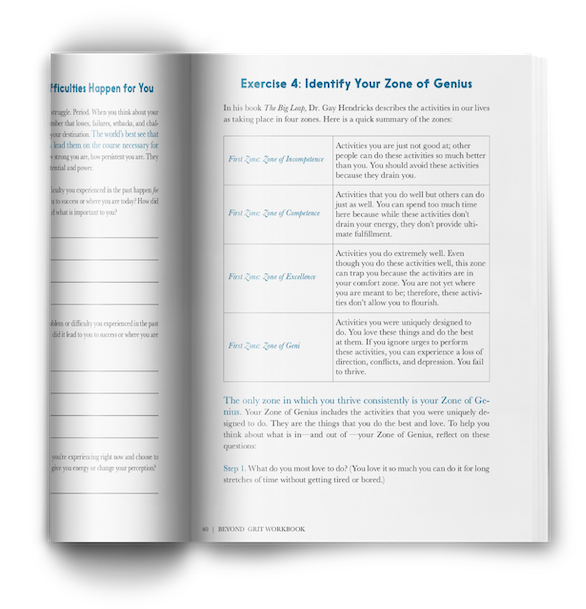 Anyone who’s ever wanted to reach a new level will absolutely love these powerful tools. Cindra Kamphoff delivers simple, effective strategies for getting the most out of yourself and achieving your goals. While working with Cindra, I have used many of these strategies to not only thrive as a professional runner, but battle cancer at the same time." "The entrepreneurial path is long, tough, and lonely . . . not that different from running a marathon. There are times when you feel the thrill of success, but there can be many more times when it just feels overwhelming. That’s why I love Beyond Grit. Cindra outlines strategies that help entrepreneurs overcome adversity and get to the next success. Business Owners: This is like having a personal coach by your side!" 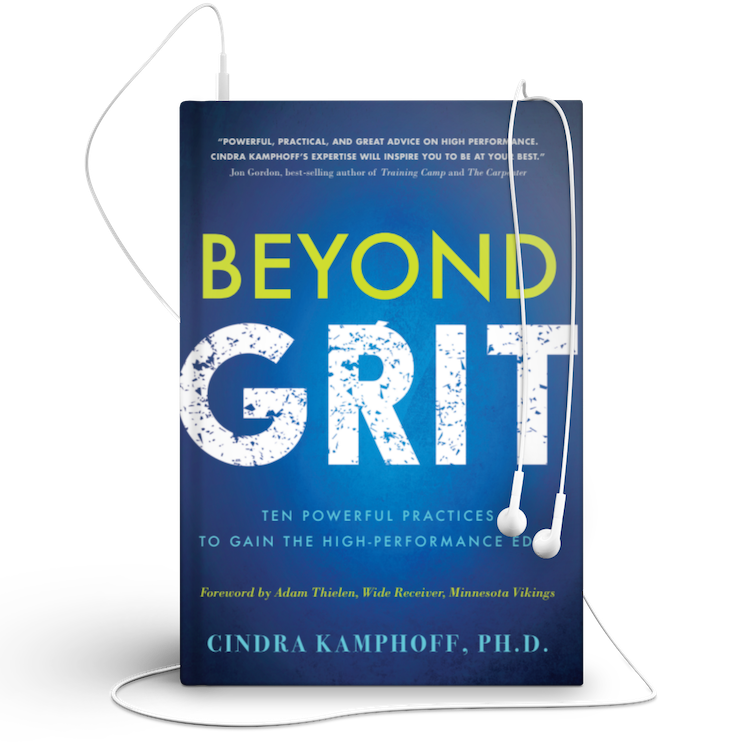 "Beyond Grit takes the concepts of resilience and perseverance and gives you practical tools and tips to create life-changing habits. Dr. Kamphoff is one of the foremost sport psychology consultants in the world, something that’s further evidenced by what is inside Beyond Grit. This is a must for those who want to perform at their absolute best." 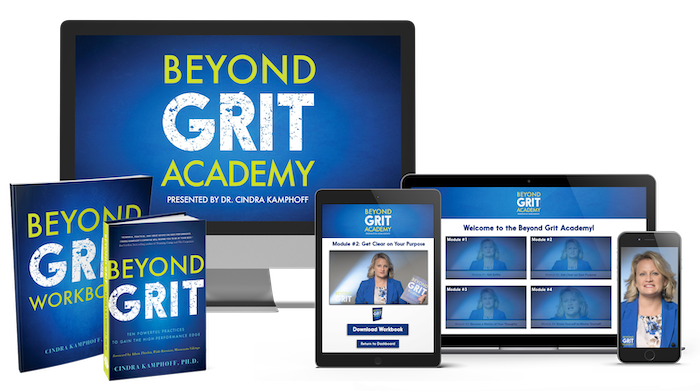 I'm excited to announce that my new Beyond Grit Academy Online Video Course is now available for you to get started today! This is built for you to quickly be able to put the strategies of the World's Best way into action. Join the Academy today and we'll mail you a hard copy of this in the mail (for free)! This online video course takes the Beyond Grit book to the next level... but this is a great companion to read through before or after you watch the videos. Prefer to listen on the go? We'll send you instant digital access to the Beyond Grit audiobook when you join the Academy so you can take this with you wherever you go. 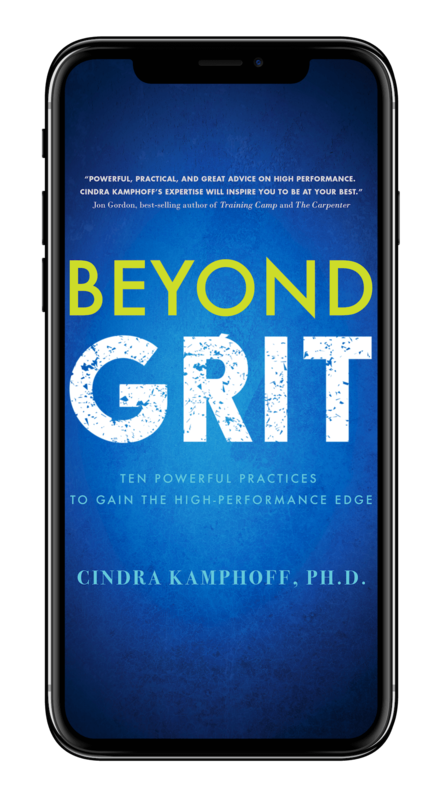 Read Beyond Grit on any tablet or mobile device! We know the hardcover book will look good on your desk or bookshelf, but the easy-to-navigate eBook is a great reference point to keep with you when you want to quickly re-visit an important chapter. 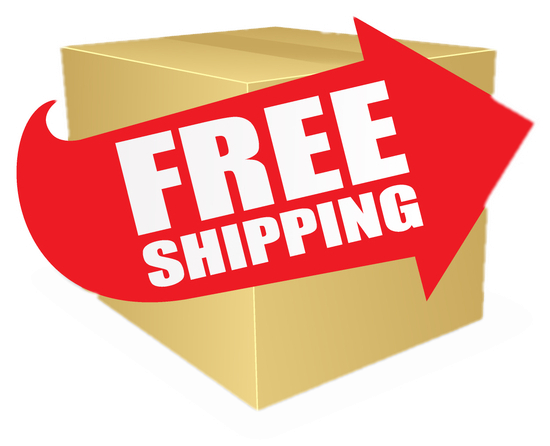 Join the Academy today and we'll cover the cost of shipping & handling to get your book and workbook out to you quickly as possible. ▸ Who is the Beyond Grit Academy for? The Beyond Grit Academy is for athletes, coaches, parents, corporate executives, entrepreneurs, and leaders in any industry who are serious about improving their performance and pursuing the best version of themselves. ▸ Can I use the Beyond Grit Academy with my team? YES! Send an email to Cindra@CindraKamphoff.com to inquire about a licensing deal that includes access for your staff/players + additional copies of the book and workbook to use as you work through the Academy. ▸ What ages is Beyond Grit Academy for? This is a question I get very often… and obviously any adult will benefit greatly from Beyond Grit but even my 14 year old son has gone through the videos and told me how much he learned from it!